When it’s time to clean our carpets, many of us shirk our responsibility because, let’s face it, it can be hard work. Still, it is a job that must be done. There’s no easy way to move all your furniture, operate a cleaning machine, and then put the furniture back when you are finished. It is because of these reasons that many people hire our professional carpet cleaning Mill Creek, WA technicians to get the job done right without all of the hassle. No longer will you have to spend countless hours doing sweaty manual labor; when you hire our company you are free to sit back and relax. We will use our industrial cleaners to get your carpet as clean as possible as well as removing all of the allergens that are trapped in the carpet fibers. 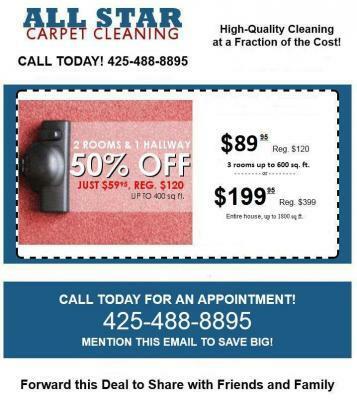 Carpeting is a major investment and must be taken care of properly so that it lasts for a long time. In addition, a dirty and/or smelly carpet reflects poorly on you. If you want your guests to feel comfortable in your home, it is important that your carpet is clean and smells fresh. If you get your carpets cleaned on a regular basis, you will ensure that even the residue that is hidden in its depths will be removed. The time may come when you are looking for a change of scenery and decide to sell your home. If you have been your carpets professionally cleaned on a regular basis (at least once a year), your home will be worth a lot more simply because of the beauty of the carpets. Having one of our professional carpet cleaning Mill Creek, WA experts clean your carpets may seem like a small thing but it can go a long way in making you feel good about the condition of your home.